“I want a dog” is a phrase that I routinely repeated as a child. Unfortunately, my father was severely allergic, so instead of getting a real dog I got a robot dog. That’s right, I had a blue plastic dog that could walk, bark and light up. It only took a few weeks for the excitement to wear off as I discovered those were the dog’s only functions. This was my first experience with a consumer robot, but it definitely will not be the last. We’ve come a long way since that barking blue dog. There are now robot-driving cars, cognitive computers that compete on “Jeopardy!” and even robotic therapy seals. After dominating industrial and logistical applications, the multi-billion dollar robotics industry is now shifting toward new consumer applications. The consumer and business robotic market has a compound annual growth rate of 17% and is estimated to become a $1.5 billion market by 2019. It’s clear that robots will continue to make their way from the assembly lines to our living rooms. Major trends like increased connectivity, as well as advanced assistive and artificial intelligence, have made the development of consumer robots possible. The robotics industry is becoming an attractive opportunity for entrepreneurs because they can leverage pre-existing software and hardware. By merging mobile apps, big data, hardware and companion device capabilities, consumer robotics have become more powerful than ever. Robots can provide users with problem-solving features that are present in digital assistant–type or artificial intelligence applications. For example, Unified Computer Intelligence, a Canadian company out of Richmond Hill, Ontario, has created an assistive intelligence product called the Ubi. By plugging into a power outlet and connecting through a Wi-Fi network, the Ubi can enable users to interact with almost anything that is connected to the Internet. The small computer can complete several tasks, such as sending messages, playing songs on request or conducting web searches. This product is changing the way that people interact with computers by leveraging the ubiquitous, hands-free nature that the product supports. This is particularly beneficial and convenient for users who have struggled to use traditional computer interfaces in the past. For example, users with visual impairments or lack of motor skills can now interact with devices and data. The Ubi can enable users to interact with almost anything that is connected to the Internet. One challenge that the consumer robotics industry is facing is that a large percentage of people have an innate discomfort with robots that look or act too human-like, especially if they are in the home. Robotic companies are working to overcome this issue by using smart product design to transform the public’s expectations of and views on consumer robotics. An excellent example of a robot that is working to overcome these consumer concerns is JIBO, a robot built specifically for the home. Known as the “world’s first family robot,” JIBO is a desktop touch-sensitive robot that includes cameras and voice recognition technology. Its two high-resolution cameras can track and recognize faces, creating an immersive video-calling experience. 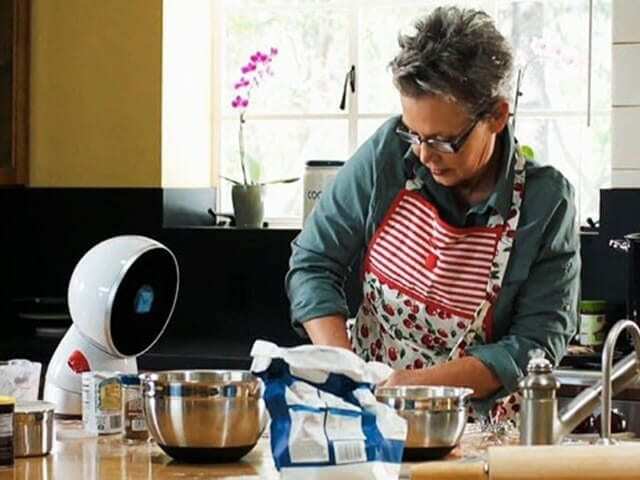 Plus, JIBO is embedded with artificial intelligence algorithms that learn from a consumer’s preferences and the robot moves to face the consumer and communicates using natural and emotive cues. The product launched on Indiegogo, raising more than $2.2 million in pledges and becoming the most successful technology campaign ever on the site. JIBO is the first social robotics platform and the Developer Edition comes with a full software development kit, enabling the developer community to create new apps, services and content for JIBO. Known as the “world’s first family robot,” JIBO is a desktop touch-sensitive robot that has cameras and voice recognition technology. Robots have been in our homes for longer than you might think. Robotic cleaners like iRobot’s Roomba vacuum date back to 1976. The company’s robots now go beyond self-directed floor cleaners and have expanded into the healthcare, military and security industries. As a result of this expansion, iRobot’s revenue climbed to roughly $50 million in 2013 and the company invested a total of $60 million in new technologies. Similar to iRobot, there are many other instances of home robotics that have the potential to spur more innovation in the home, as well as in other fields. I sat down with Brian Lee and Rehman Merali, co-founders of tBOT (which will soon be renamed to teaBOT), to talk about their product, the challenges of the robotics industry and their experience with the JOLT program at MaRS. Their product is an automated kiosk that blends, bags and serves custom tea using robotics. Sarah Aspler: What inspired you to create this product? Brian Lee: My family owns a loose-leaf tea store in Sudbury, Ontario. I was in the store one day and noticed that there was a huge line of people. I saw that people did not enter the store because of the size of the line and probably went to another store for tea. It was then that I realized that technology could solve this problem. I connected with my friend Rehman, who is a PhD candidate in robotics, and we came up with the idea of making a robot. We went to the Creative Destruction Lab at University of Toronto and built our prototype. Our goal was to make a cup of loose-leaf tea quickly. Rehman Merali: Our initial prototype used only eight blends. After we built this machine that could dispense specific quantities of blends, we realized that we could combine individual ingredients to create our own blends. We mix the raw ingredients to make your custom blend and that’s when we realized that we didn’t just have a product, we also had a business. The idea is that you can also modify the ratios of the tea, resulting in a completely personalized product. SA: What are the next steps your team is taking to improve the product and experience? BL: We eventually want to roll out an app that completely automates the entire process and includes tracking, payments and monitoring consumption functionality. Using the app, users can create and save recipes on their phone, share them with their friends and order them quickly. We’re also looking at creating different categories of tBOTs. Students, young professionals and older professionals all have different preferences. For example, for older users the tBOT could offer mulberry or healthier sugar-management teas. RM: We’re also working on a bag sealer. We are rebuilding it to make a bag while the tea is being prepared. The long-term vision is that if you use a travel mug, the machine will have a level sensor to measure how tall the mug is and will allow the bag to fold over to the exact size. Our solution is to create bags that seal on all four sides so there’s never an issue with tea falling outside of the bag. These bags would enable users to walk away with not only a cup of tea, but also with sealed bags to use later. SA: Could you tell me a bit about your experience working with JOLT? BL: The space that JOLT offers is fantastic. We work with our mentors and use the MaRS resources. The great thing about JOLT is that they help us with the day-to-day problems. It’s like a staff and community of people available to talk through problems and think about solutions. It’s valuable to work with all of these other startups where we can all collaborate. There are even other small hardware companies, too, which have become great resources for us because we share the same challenges. RM: JOLT has also put us in touch with other incubators. For example, there’s a hardware incubator in Boston and we’re going there soon to pitch to investors and talk with other startups. SA: What advice would you give to entrepreneurs in the robotics space? BL: Don’t underestimate the power of a 3D printer. You don’t want to wait three days when you can try it out on a 3D printer in less than two hours. After printing it, then you can place an order. RM: I would encourage entrepreneurs to be hackers. There are these amazing hackathons that happen all over the city. One of our employees built a 3D printer. He found the designs online, downloaded resources and just started building it himself. Those are the type of people we look for. We want to work with people who don’t mind getting their hands dirty.